A low to medium shrub, it is usually evergreen but loses its leaves in colder climates. Its habit is very dense and mounding, with ovate to lance-shaped dark green leaves, 1 1/2 to 3 inches long, that turn orange to red-purple in fall. Frgrant, widely funnel-shaped flowers are borne in trusses of 2 to 4 blooms and are rose pink to light to medium purple. 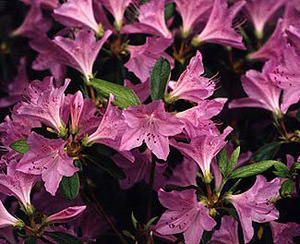 Though azaleas have a potentially large list of possible pest and disease problems, they are usually trouble free if planted correctly in proper cultural conditions.